Burn After Reading is a film directed by Joel and Ethan Coen, also known as the Coen brothers, and was distributed by Focus Features. The film was released September 12, 2008 in the United States. Burn After Reading stars George Clooney as Harry Pfarrer, Frances McDormand as Linda Litzke, and Brad Pitt as Chad Feldheimer. John Malkovich, Tilda Swinton, Richard Jenkins, and Elizabeth Marvel co-star. Burn After Reading follows in the footsteps of the Coen brother’s previous films. The humor is dark and satirical, there are several scenes where shocking violence occurs without seemingly rational explanations for the film’s narrative, and many characters are exemplary examples of foolish behavior. Despite some negative reviews, Burn After Reading was largely praised by critics for its nuanced storytelling, cynicism, and distinct attention to detail. Clooney and Pitt were praised for their performances as oddball heroes, and Pitt received a BAFTA nomination for his performance. Burn After Reading claimed the number one spot after its release at the box office, and went on to perform reasonably well in its subsequent weeks. 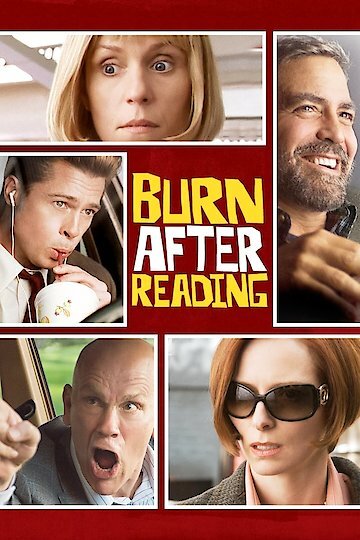 Burn After Reading is currently available to watch and stream, download, buy on demand at Netflix, Amazon, Vudu, Google Play, FandangoNow, iTunes, YouTube VOD online.